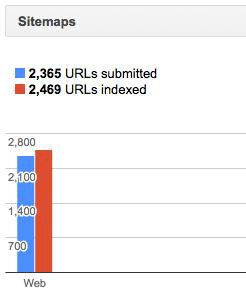 Google Webmaster Tools Shows More Pages Indexed Than Submitted In The Sitemap File. Why? Home > Google News > Google SEO > Why Would Google Show More Indexed Pages Than Submitted Pages In Your Sitemap Report? A webmaster asked Google why would Google show more indexed URLs than submitted URLs in the Google Webmaster Tools Sitemaps reporting section? How can this happen? John Mueller responded on Twitter saying it is a timing issue. Indeed that was true. Shortly after, Google Webmaster Tools updated the report and the numbers now make sense.